Minecraft has invaded every platform imaginable; from PC and mobile, to Xbox 360 and PS4. The Wii U Edition in particular wasn’t released until late in the system’s lifespan – December 2015 to be exact – and by then it was essentially on its last legs. In contrast, the Nintendo Switch Edition has been released within the first few months of the Switch’s launch, giving it a stronger presence for both new and old fans alike. While the Switch Edition may lack innovation and is on-par with other versions, the console’s portability make this entry an attractive one for players who are constantly on the go. On the off chance you’re unfamiliar with Minecraft, the game is a creative sandbox experience that is limited only by your imagination. The world is composed of 3D blocks which can be broken and placed across the landscape to create anything imaginable from trees and rivers, to gardens and houses. While this core idea remains the same throughout, there are various gameplay modes to suit different play styles. Minecraft’s Survival and Adventure modes challenge players to harvest resources, such as wood and ore, and create shelter to avoid monsters which appear at night. You must also ensure your character gets food, so you will have to eventually leave your shelter to find more resources, etc. Creative mode is more relaxed and arguably the most popular mode. Here you have access to all (and unlimited) resources, so you don’t have to worry about any beasties killing you and can let your imagination run wild. The Nintendo Switch Edition features the exclusive Super Mario Mash-Up pack which has previously only been in the Wii U Edition. This entitles players to several Mario skins including Bowser, Wario, Princess Peach, Luigi and naturally the red Italian plumber himself. 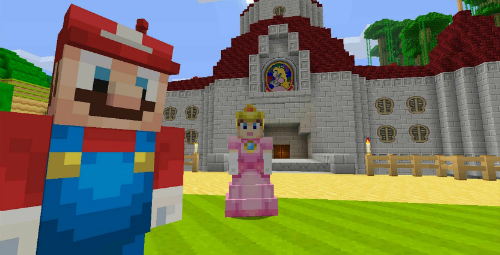 The main highlight though is you can explore a Minecraft version of the Mushroom Kingdom, complete with pixel art, 3D block models of various characters, Princess Peach’s castle and many other locations. 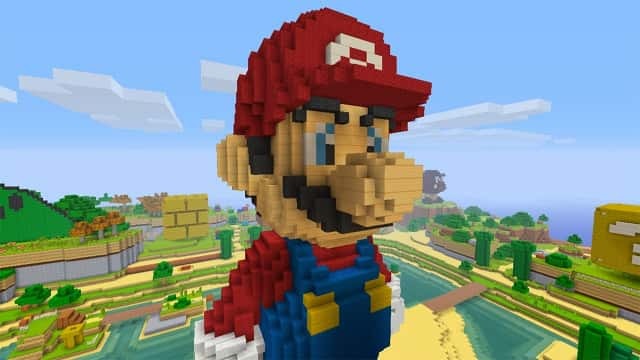 It’s a great playground for Nintendo fans, and the transition to the pixelated 3D blocks works surprisingly well given the Mario series’ long history. The best feature of the Switch Edition actually has nothing to do with the game itself but the capabilities of the console – you can take the game on the go at any time or play it on a TV screen. If you prefer playing with a controller instead of a mouse and keyboard, then the Switch Edition is arguably the definitive portable version. The worlds are larger than the Pocket Editions for mobile, you don’t have to carry around a potentially bulky laptop, and you’re getting the same content that’s available in other versions. There are a few limitations though; namely that the game is only displayed at 720p in both Tabletop and TV modes. In Tabletop mode the draw distance is also shorter than other versions of the game, so pop-ins are more noticeable. These are only minor though, and won’t distract too much from the overall experience. The game operates at a smooth 60 frames per second in both single-player and two-player splitscreen. When playing with three or four players the frame rate does dip a bit, but that’s to be expected. Be warned that for local multiplayer each player will require both joycon controllers or a gamepad controller. In regards to online multiplayer you can see when friends are online and join their games, but at the moment there’s no way to invite friends into your own world. There’s also no support for in-game voice chat, but once Nintendo’s paid online service begins you will presumably have that function available via their app interface. At launch the Switch Edition was missing a few features that were available in the Xbox One, PS4 and PC versions including mini-games and some texture packs. 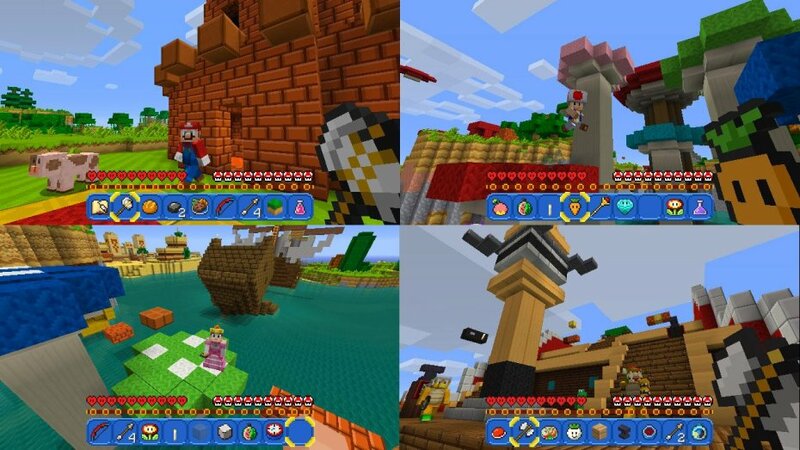 Developer 4J Studios have since released a patch bringing the game on-par with other versions, and have promised they will maintain future support. This should keep players pleased and will ensure the Switch Edition stays relevant. While Minecraft: Nintendo Switch Edition doesn’t bring anything new to the table, it’s a great port that is on-par with other versions and is enhanced thanks to the Switch’s ability to act as both a portable and home console. This is easily the definitive portable version of Minecraft yet, so it’s worth picking up if you’re looking to play it on the go.